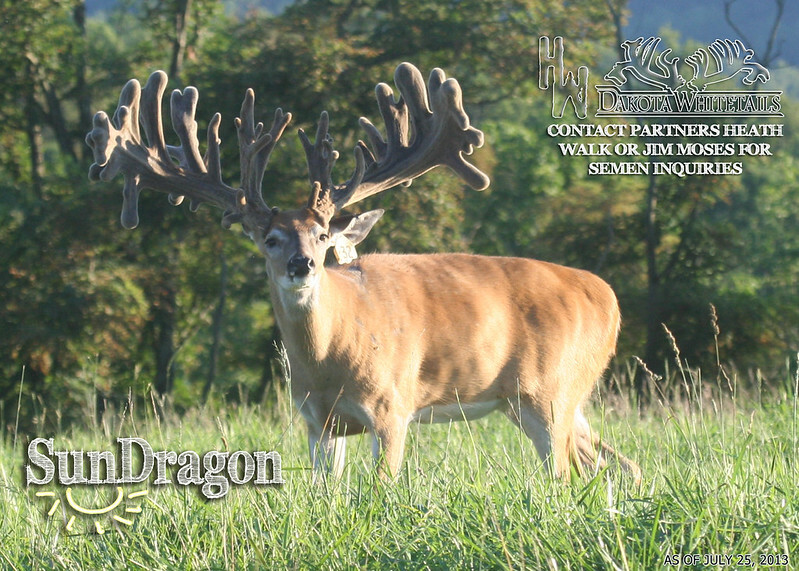 Deer Farmer - SUN DRAGON Contest - Win a FREE straw and possibly $5000 CASH! Jim Moses and I are excited to offer your chance to win a FREE straw of SUN DRAGON to whomever comes closest to guessing Sun Dragon's score. The great news: if you purchase at least one straw of Sun Dragon prior to the submission deadline and are the correct guesser, not only do you win a FREE straw but also $5000 in CASH! One guess per person. If you send in more than one, your first submission will be used. Please feel free to post your guesses here but your guess must be emailed to jim@dakotaoutfittersllc.com to be entered into the contest. I will be having a submission box at Kevin Grace's auction later this month for anyone that doesn't have email. There will be one winner and if there is a tie, the closest guess to inside spread will determine the winner. Don't forget to add your guess for inside spread. Here is Sun Dragon from July 25th. Jim or I will post new pictures and an updated video later this week as well as later this month. 490. 35 1/2 wide. Thanks. My Guess is 445 4/8 with 32 1/2 I.S. 398 4/8" 35 5/8" Inside. Awesome Buck!! Thanks for the chance! Thank you so much for the guesses so far! WOW! Make sure you watch the video as Dragon has a BUNCH of inches on the backside. PLEASE when you FF0000email me your guess for total gross SCI score with spread, include your name and a phone number. If you do not email me with your guess (or hand it in in-person), FF0000your entry does not count. Since these posts can be edited and changed and big cash is involved, email seemed to be the fairest solution. PLUS - user id's don't reflect a person's name but sometimes just for example "mike". If you have guessed a score and don't see your name above, please know your entry will not count unless it is FF0000emailed. Don't forget to forward FF0000your guess with your name and phone number! Again, I cannot thank you enough for all of the kind comments. That has gotta be the best looking buck so far this year! Awesome buck guys and thanks. Gotta make sure I buy a straw soon so I can win the cash also .